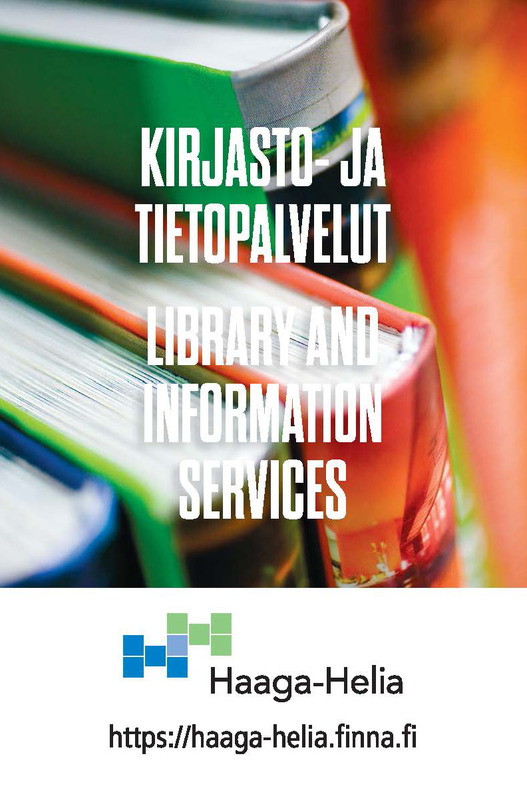 This guide contains information on library and information services available for Haaga-Helia personnel. Is something missing? Give us feedback! Apply for your library card online and come visit the library. If you're new to Haaga-Helia, contact your unit's information specialist or librarian to arrange a library orientation session and pick-up of your library card. Remember to bring a photo ID with you. Library cards are personal and the card owner is responsible for all materials borrowed using his or her card. For this reason, we do not recommend that you loan materials borrowed using your card to students, for example. When you've received your library card, you need to link it to your HH Finna account. See an instruction video here. Visit the library preferably during opening hours. Please make sure not to take materials from the library without loaning them using a loaning machine or dealing with a member of library staff. If you want to visit the library or bring a group of students to learn about the library outside its opening hours, please make sure to arrange the matter in advance with the library. Materials should be returned to the library before their due date if they are no longer needed. In this way our materials are available for use by all library customers. Make a reservation or request books from other Haaga-Helia libraries in HH Finna. Deliveries within Helsinki every working day, between Helsinki and Porvoo on Tuesday and Thursday. Deliveries to and from Vierumäki are mailed by post. The materials you have ordered can be delivered directly to your post box, if your unit has such an arrangement in place. You can sign in to your account and renew your loans on HH Finna. Loans may be renewed ten times if no reservations have been made. Sign in to access your customer information using your Haaga-Helia user ID and password. Materials from libraries outside of the Helsinki Metropolitan Area can only be received at as inter-library loans. For Haaga-Helia personnel, they are free of charge. However, we do not request inter-library loans from libraries in the Helsinki Metropolitan Area. If the book you are looking for is available at another library in the Helsinki area, contact directly the library in question.